Be the first to share your favorite memory, photo or story of Betty Lulu. This memorial page is dedicated for family, friends and future generations to celebrate the life of their loved one. Betty Lulu Louise Nemechek was born in Stillwater, Oklahoma on January 8, 1920 to parents Edward M. Crabtree and Carrie Ensley Crabtree. 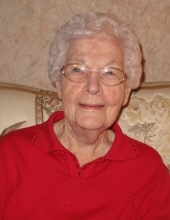 Betty passed away April 10, 2018 in Ponca City at the age of 98. Betty graduated from Stillwater High School and Stillwater Business School. She married Edward J. Nemechek on September 18, 1941. Betty and Ed moved to a family farm north of Ceres, Oklahoma in 1949. She worked for the Red Rock Co-Op for 35 years while also helping Ed with the farm. Both retired in 1982 and moved to Perry, Oklahoma until his passing in 2013. She then moved to Via Christi Village, Ponca City, OK; where she resided at the time of her death. Betty is survived by her three children; Mary Lynn Taylor (Paul W), Ponca City, Glenda Louise Jones (David), Aurora, Colorado, and James Lee (Jim) Nemechek (Joan), Stillwater, OK. She is also survived by sister-in-law, Sara Crabtree Wright, Birmingham, AL, and six grandchildren, nine great grandchildren and one great, great grandchild. Also many nieces and nephews. Betty was preceded in death by her spouse, Edward Jerry Nemechek, four brothers, two sisters, one grandson and one granddaughter. A celebration of her life will be held on Saturday, April 14, 2018 at 11:00 am at Trout Funeral Home of Perry chapel. Family will be available to greet friends on Friday, April 13, 2018 from 4-6 p.m. at Trout Funeral Home in Perry. Family would like for you to share your memories of Betty at www.troutperry.com. Memorials may be made to Hospice of North Central Oklahoma in care of Trout Funeral Home, 1408 N. 7th Street, Perry OK 73077. To send flowers or a remembrance gift to the family of Betty Lulu Louise Nemechek, please visit our Tribute Store. "Email Address" would like to share the life celebration of Betty Lulu Louise Nemechek. Click on the "link" to go to share a favorite memory or leave a condolence message for the family.